Košice (pronounced Ko-shi-tse) is the second largest city in Slovakia, with a population of over 250,000. It was selected the European Capital of Culture 2013. Košice has had a colourful history with its ever changing medieval and modern rulers of Hungarians, these days hardly imaginable Turks for a while, Czechs and nowadays Slovaks. Serving its part as a center of what may best be described as a frontier of Slovak hill country, Hungarian lowlands and Ukrainian/Russian/Soviet East, it has become a predominantly Slovak city in what was then Czechoslovakia after its emergence in chaos of reconciliations after the First World War. Until these days the city is inhabited by descendants of east Slovak dwellers with many relations in the gorgeous rural surroundings of the city who were flocking to the town during its industrial boom after the WW2 and a large Hungarian speaking minority along with its fast growing underprivileged and often resented population of Gypsies (or Romas as is their official naming). A smart, patient and crying with the wolves traveller may find the city suffer from what may best be described as a small man syndrome, a feeling shared by many locals probably best attributed to being the second city in Slovakia and a place not often visited from elsewhere. This may however help in engaging with many residents who may seem to be one of those lovely people who actually enjoy foreigners visiting their place. The city prides on being known as "The City of Peace" thanks to non-violent ethnic and national tolerance throughout its history. Despite its relative remoteness, you may likely find Košice a hidden, unknown and approachable gem when seeking for a lesson in less known European history, lively arts scene or for a less spiritual entertainment thanks to its vibrant party scene. The area around Košice has been inhabited since the 8th century, but it was in the 13th century that it developed into a town. It grew relatively rich during the Middle Ages due to its strategic position as a trading center. Having briefly served as the capital of the liberated Czechoslovakia after World War II, it is now finding its new role as one of the easternmost centers of the new European Union. It provides a look into the not-that-long-gone way of living in an eastern European country while also serving as a lovely example of a booming and rapidly changing place with rich ancient history best served by its stunning historic city center, with an impressive cathedral quickening the hear-beat of every picture hunting traveller. 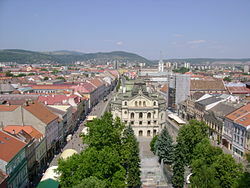 Košice has a continental climate with hot and relatively humid summers and cold winters. Summer (July–August) temperatures may rise up to 30+ degrees Celsius with stretches of rainy weeks and 15 degrees at max, while winter (December–February) weather is mainly freezing with stretches of weeks with significant snowfall and temperatures of max -10 Celsius, interspersed with weeks of positive temperatures during the day. City receives relatively a lot of sunshine hours with winter months being the most gloomy. Winds and humidity may make the winter time rather uncomfortable, but temperatures usually stay above those in areas of hilly country north of the city and most of Slovakia. Snow and skiing forecast may vary unpredictably within a week ahead. Best season to visit may be the blooming and lovely spring of late April/May, though damp weather may occur unforseeably for a week or two regardless of a season. Official city of Košice Visitor Centre  is located in the inner part of the city at Hlavná 59, Tel +421 55 625 8888, email: info@visitkosice.eu. It provides complex information on the city as a destination, tourism packages in the city and where to explore the region, and also official city guides in various languages. With helpful staff it will help you to make your stay in Košice easier, fun and memorable. The privately run another municipality information center (MiC KOŠICE) , is on Hlavna 2 or Pri pracharni 4. Tel +421 911484337, e-mail: info@MiCKOSICE.sk. Provides information on the city and official guides for Košice and the nearby region. English, German, Hungarian, French, Russian, Spanish, Polish and Italian speakers available. 48.66305621.2411111 Košice International Airport (KSC IATA). You can fly to Košice from London, Bratislava, Vienna or Prague with the discount carrier Wizz Air and from Istanbul on Turkish Airlines. There are more daytime connections with a change at Puchov. Be aware that Horehronec train follows a different and slower path, via rural central Slovakia, and the journey lasts for 7½ hr. But it also offers fairly spectacular nature scenes especially at section between Brezno and Margecany. Journeys on many Slovakian trains may be interrupted after 100 km off the starting point while you remain within your ticket validity dates. There's no suitable train connection from Poland. Given the efficiency and value of the train system, you shouldn't need to use the bus system very much. Eurolines coaches come to here from numerous European cities, and bus is the most efficient way of reaching the nearby town of Levoca. There are also several companies linking Košice with Prague, usually with several stops on the route, including Brno. Flixbus has direct buses to Kosice from Kraków (4½ hr, also serving Bardejov and Presov). Košice has a small and compact city center, and is mostly navigable by foot. If you are staying in the suburbs, the tram system is cheap and efficient. With good bus and tram connections around the whole city , transport is very easy to handle. You can get practically anywhere by public transport and all the main sights of the city are within walking distance. Most of Košice's attractions are along the main pedestrianized street, known as Hlavná ulica (Main Street), Námestie Maratónu Mieru (Peace Marathon Square, the north end of Hlavna), and Námestie Osloboditeľov (Square of the liberators, at the southern end of Hlavna) at various parts. [dead link] Saint Urban's tower (Urbanova veža). Originally a Gothic prismatic campanile with a pyramidal roof dating back to the turn of the 14th and 15th centuries. The bell, which was installed in the tower (its weight equals to 7 tones), was dedicated to St. Urban, the patron of wine-prowers, which was cast in a mould by the bell founder Frantisek Illenfeld of Olomouc in 1557. 36 tombstones dating from the 14th century (one of these tombstones is Roman dating from the 4th century) to the 17th century were put into the outer walls of the Tower. In 1966 the Tower was damaged by fire, which destroyed the roofing and the bells. In the years 1967-1971 the Tower was subjected to restoration and renovation. Palaces of Košice. Košice is the city which has the highest number of palaces in Slovakia and all of them are worth seeing. Perhaps the most important palace is the Former Town Hall [dead link], which is the oldest of Košice's council offices. The Andrassy's Palace [dead link] today serves as the biggest cafeteria and patisserie - AIDA. The other palaces include The Bishop's Palace [dead link], Hadik - Barkoczy Palace [dead link], Pongrácz - Forgács' Palace [dead link] - the seat of the Regional State Library and Csáky - Dessewffy Palace [dead link] - at present the building is the seat of the Constitutional Court of Slovak Republic and at the same time it is the so-called 'palace of the books' as you can find the biggest bookstore of Košice, selling books not only in Slovak, but also in Hungarian, English, German and other languages. We shall not to forget about the Captain's Palace [dead link] where you can find the Slovak Technical museum and last but not least, Jacab's Palace which was erected in 1899 in the pseudo-Gothic style constructed from discarded stones from the Kosice St. Elizabeth's Cathedral and most of the inhabitants of Košice would choose this building as one of the most beautiful ones. Beggar's House - For an interesting story you may look up the Beggar's House which is one of the historical houses on Hlavna (on the right between the Theater and Immaculata when walking up north). On forefront, at top of the house you will see a statue of a guy with a hat thanking/begging for alms. The story says the career beggar who had no other income had over years used generosity of rich Košice dwellers to build the house at what was then a very 'high-end' medieval (a.k.a. Hlavna Street) part of Košice. This kind of largess may seem to be perceived a bit strange by today's beggars rarely appreciating Košice inhabitants, but it still makes up for a good narrative. And a historic house. East Slovak Museum (Vychodoslovenske muzeum) was established in 1872 and it is one of the oldest and most significant museums in Slovakia. From the architectonic point of view, the buildings of the museum itself are very interesting historical sights. In this museum, the following permanent expositions can be found: the nature of Carpathia, Hundreds of years of art, "Rodosto" - the memorial house of Franz II. Rakoczy, Artistic metal founding in Eastern Slovakia and Centuries of Košice - Mikluš's Prison. Except these expositions, there are always some temporary events and expositions. Muzeum Vojtecha Lofflera, 20 Alzbetina ulica. Likely interesting for the more art inclined traveler after seeing the usual government sponsored touristy stuff. Walking the historic center. The best thing to do on a short trip or shortly after arriving is to walk the compact and lovely historic center. Singing fountain. You may find it difficult not to find the 'singing fountain' in front of the theater enjoyable on warm afternoons or evenings. Calm music tunes and accompanying water salvos provide lovely vibes for couples enjoying their ice cream and serve as a hilarious entertainment for the kids. Day hikes - All hiking trails in the gorgeous surroundings of the city may be looked up at . Apart from magnificent, relatively close and serious mountains of High Tatras (~1½ hr on the train to Stary Smokovec with a stopover in Poprad, take one of the faster 'rychlik' trains) you may take up on an easily public transport approachable Bankov [bunkow] (hop on a bus #14 from Havlickova or Mier to Horny Bankov stop) providing nice views of the city, Jahodna [yahhodna] (a bit more distant, small but enjoyable also on summer days ski resort, the #14 bus also), or Vyhliadkova Veza (the sightseeing tower, overseeing the city, #29 bus from center, direction at the ZOO or 'Kavecany'). For a more challenging hike you may take the train to 'Ruzin' stop (you need to take the slower 'osobny vlak' train as the faster ones stop in farther Margecany station only), walk up the hill splurging in wonderful views of the surrounding hill country and the Ruzin dam along the yellow trail. The trip up and to the other side (take the green trail straight to the west then) of the Sivec [seewatz] hill (Kosicke Hamre bus stop, with last bus connection to Kosice at 17:24) takes about 2.5 hours and makes for great views and photographs. For a shorter and easier hike to Sivec take the bus from bus station to Kosicke Hamre and walk up the hill on the green trail. Mid-range accommodation and food is provided at Kosicke Hamre at 'Sivec Pension' and 'Bradan'. Ruzin dam also makes up for nice fishing (permit required) and boat rides. For another lovely day-trip, you may take the 30 minute 'osobny vlak' train south to Slanec [slahnetz] township and enjoy lovely sights from the top of the hill with interesting ruins of a small medieval castle. For those interested in less distant history, take the bus from bus station to Dargov, a place of a major WW2 battle with real tanks and a war museum. A trip entertaining for kids with lovely surroundings asking for a hike and with the Herlany geyser in medium hiking distance. Anicka - pronounced as [ahnjiczka]. A popular park area and easily approachable weekend hangout for many locals. Tennis, playgrounds for children, summer swimming pool, pubs and lovely evening walks by the river. Take bus 71/72/29 north from the city center to 'Mier' stop and ask for directions. You won't need to walk or travel long distances anywhere when craving for shopping in Košice while you stay in the center or most inner city areas. There are quite a few shopping malls in Košice, you may also find many historical center buildings hide interesting and chick boutiques while roaming around. OC Galéria Košice. Is the newest and the second biggest shopping center in Košice. It is located nearer to the city center than Optima. You may find it 10 minutes walk west (up the steeper hill) of Steel Arena ice hockey stadium, Toryska street. [dead link] Aupark. Located in city center at Námestie osloboditeľov. AJVEGA, 10 Orlia (turn left when walking Mlynska west towards Hlavna from the train station). A vegetarian and celiac diet friendly meals and pizzas providing restaurant. Dietary meals (with some including meat) offered at the 'tower', upstairs. A quiet place with a terrace enjoyable on warmer days. A weekday inexpensive midday lunch menu offered. Panda Asian bistro, Fejova 13, open from 09:00 to 19:00, closed on Sunday, good and cheap food, average price for lunch is €3,50. Ask for opekane rezance, Asian style noodles for €1,50. Med Malina. Restaurant, Hlavná 81, open from 10am till 10pm every day, and till 11 pm on Fridays. Offers good food, English speaking staff, wi-fi internet access and cosy traditional environment. Golem. Dominikanske namestie 15, next to the church. Nice pub and restaurant with an indulging vibe usually on all week days. Try out their own microbrewery produced beers and home made pickled ermine cheese. Košice is faithful to its east Slovakian tradition in providing great and cheap parties for both locals and travellers while competing with many of Europe's much bigger and more often visited cities in what travel books usually call 'liveliness'. Season may vary with summer months unexpectedly providing a bit of a lull in usual Friday/Saturday silliness but city's center compact and concentrated bar scene provides many hidden gems disregard of day of week or month of the year. If you walk evening Hlavna after seeing everything 'important', do not hesitate to ask around. Only beware of getting caught up in acts of suspicious types, visiting parks at nights etc., as this place, though being relatively safe, really may be called the frontier of civilized part of Europe at times. Common safety measures for women and lone travelers are advisable. 48.7195221.259891 Amana Tea House, Hlavná 21. open from 10am to 10pm. Literally hundreds of teas to chose from, and friendly staff to help you chose. Very special ambiance, with several sitting corners, games. A great place to hide from the rain or have a peaceful moment. 48.7214621.256742 Beer House, Hlavná 54. Beer House offers probably the widest range of beers in the city. The cheapest beer is for €1,06/0.5l, most expensive €1.96/0.5l .They offer pizza at the same time and you can order it until 2am. There is live music every Thursday and Saturday. Cambridge, a 5 minute walk or 1 stop tram ride north of Namestie Maratonu Mieru (the north end of Hlavna). A popular Slovakian style and cheap 'biergarten' enjoyable on warm evenings within easy reach of the center. Collosseum. Dominikanske namestie, at the end of the square with a bit of hidden entry though fairly huge with several pubs inside the space. An alternative music and lifestyle craving types may find this one to be a great place for an entertaining hangout or a not occasional international live music act. Also a great place for partying even until the weekday wee hours. Discretion or attending in wider groups may be advised. Jazz Club, 39 Kovacska (right next to Hlavna, one street to the east from Immaculata). Despite the confusing name (no jazz music happening in there) providing for the dance music and party craving types and being the place to go for the regular night entertainment seeking locals on most week days. A bit overpriced but definitely lively. [dead link] Golem. Dominikanske namestie next to Hlavna, on the corner next to the church. Nice pub and restaurant with an evening vibe and their own tasty microbrewery produced beer. [dead link] Smallvill Tea House. Masiarska 50. A fine tea house with a wide range of quality loose tea to offer, often referred to as the best one in the town. You can choose from numerous quality teas from all over the world, as well as there are also some specialities you can get only here. In addition, you can try a water-pipe (shisha, hookah.) here with numerous options for quality tobacco blends. With its friendly atmosphere, fine lounge music and with a blend of exotic scents, it is the best place to relax with a book in your hand, or just to hang out with friends. Tarantino, hidden at a passage to Hlavna at south end of Masiarska. A tiny (their 'vault' offers some extra and private space if you do not fear an inside of a colour painted submarine like feel) local artsy and intellectual types' favorite hangout owned by a charismatic and friendly young couple. A nice place with good music, good beers and fancy cocktails, and a proper place for a date after a dinner. MEI hostel, ☎ +421 55-642 35 11. Is a budget hostel for tourists, not far away from the historical centre. A price for a double room starts from €30. Contact: Kysucká 16, e-mail: recepcia@meihostel.sk. Hotel Gloria Palace, Bottova 1. Accommodation at modern-day standards in single and twin-bed rooms and suites. All rooms have their own bathroom and WC, color television with 10 channels supplied by cable and telephone. Guests have internet access on the reception. Doubletree by Hilton Košice, Hlavna 1, ☎ +421 55-3251 100. Modern amenities and warm hospitality. The newly renovated downtown hotel. Hotel Yasmin Košice, Tyršovo nábrežie 1, ☎ +421 55 795 11 00, e-mail: info@hotel-yasmin.sk. 4* designer hotel steps from the historical pedestrian zone. Hotel Zlaty Dukat Košice, Hlavná 16, ☎ +421 55 7279333, fax: +421 55 7279344, e-mail: hotel@hotelzlatydukat.sk. Four star hotel offering luxurious premises. Glass museum in the hotel and gourmet specialties. Boutique Hotel Bristol Košice, Orlia 3, ☎ +421 55 729 00 77, +421 55 729 00 78, fax: +421 55 729 00 79, e-mail: info@hotelbristol.sk. A 4-star hotel with a Roman spa. Hotel Bankov Košice, Dolný Bankov 2, – 4, ☎ +421 55 63 245 22, fax: +421 55 63 245 40, e-mail: reception@hotelbankov.sk. Elegant 4* hotel with a charming atmosphere and style in quiet environment. The oldest existing hotel in Slovakia. Avoid parks and the train station surroundings at night. Do not be overly generous to the homeless and pay caution to impoverished gypsies including children and do not engage with them. Call 112 for medical, police or fire department help. There are a few trains per day (2½ hr) to Chop (Čop/Чоп) in Ukraine if you're looking for just another country. It's easy to hitchhike out of town. This city travel guide to Košice is a usable article. It has information on how to get there and on restaurants and hotels. An adventurous person could use this article, but please feel free to improve it by editing the page.